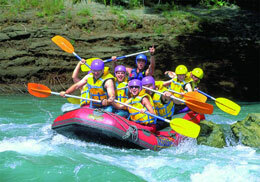 Adrenalin-pumping Jetboating and Rafting Experiences! There’s nothing like the thrill of jetboating on New Zealand’s rivers – in fact, we invented it! New Zealand’s Bill Hamilton pioneered jet boat design in the 1950s and since then it’s become a premier outdoor activity worldwide. Jetboat down the stunning Waiau River Gorge. Feel the thrills as you twist and turn between the steep rocky walls of the Waiau Gorge, passing within centimeters of rocks and steep cliff faces and over whitewater rapids. Experience the speed and excitement of a jetboat journey along one of New Zealand’s famous braided rivers. Hang on tight for the famous Hamilton Jet 360 degree spin! Experience the high-adrenaline thrills of whitewater rafting on one of the South Island’s powerful shingle rivers! Ride through the narrow, winding Waiau Gorge, over white water rapids and past steep rock faces and boulders. View the tranquil water holes and pools where trout can often be seen, and admire the rock formations caused by the unique geology of the region. A “Kiwi” adventure for the whole family! Contact us for further details and to arrange your Jetboating and Rafting experiences at Hanmer Springs.